We have really missed this meal since going keto, low carb, and THM but last night I Trim Healthy Mama-fied it. I made it as an “s” meal, which is a healthy fats, low carb meal, because I wanted me some cheese. 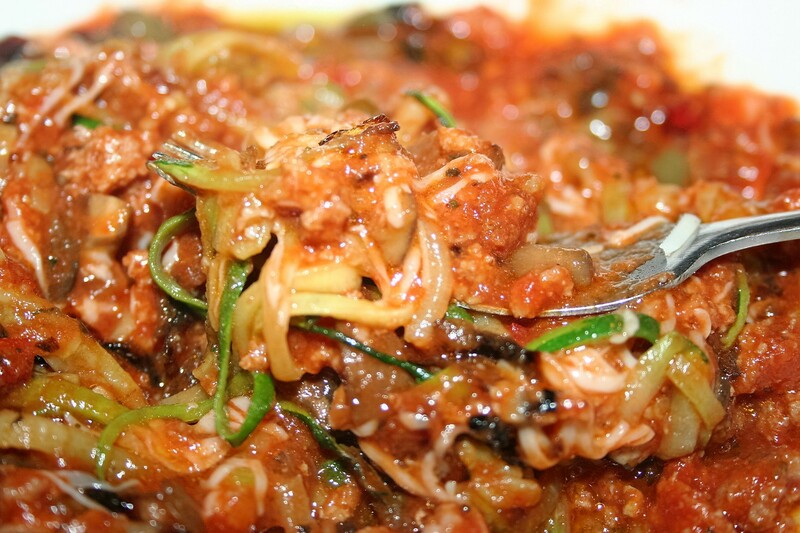 If you are not on a low carb or low fat diet, you can find the original recipe here. Start by boiling water for your pasta. 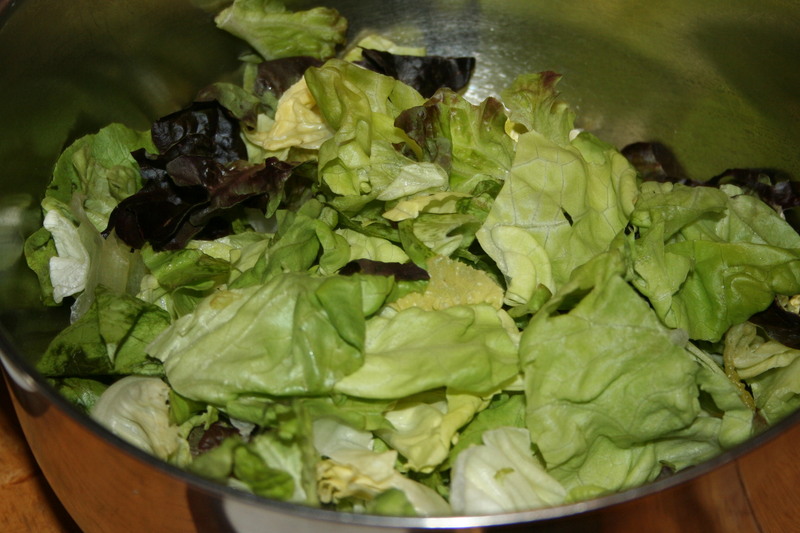 Chop up your lettuce and place it in the bowl. Shred or cube the cheese. Unfortunately we used our cheddar cheese because I forgot and used it earlier in the week, so we had to use mozzarella. Tiff added some diced red pepper. It wasn’t enough but it was what we had. Brown the ground meat; we used ground turkey. 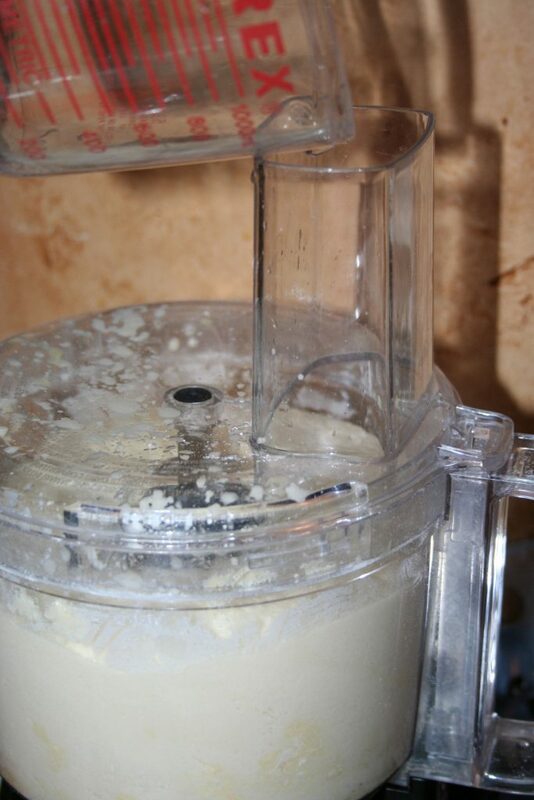 Quickly chop mushrooms in a food processor. When most of the liquid is evaporated, season it however you like your taco meat seasoned. I used these with salt and pepper. Very light on the cumin, oregano, and garlic powder. Heavier on the paprika, onion powder, salt, and pepper. And a bit heavier with the chili powder, unless you don’t prefer it. When the pasta is done, drain and rinse with cool water. 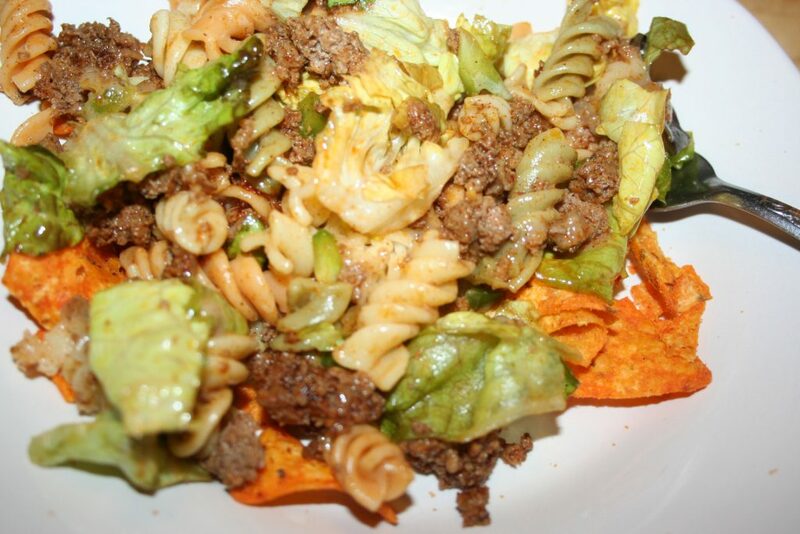 Then combine with the lettuce and meat. 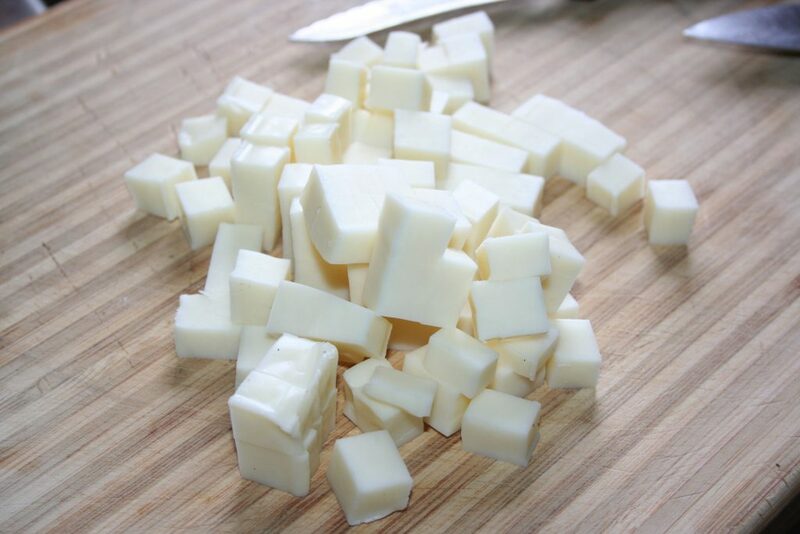 Sometimes we keep the cheese cubes out for each to include themselves as sometimes they sink to the bottom of the bowl and they are not evenly distributed through the salad. The kids don’t prefer the tomatoes either. Then I add my dressing. Combine all ingredients and serve with dressing of choice. Hope you like it as much as we did last night. 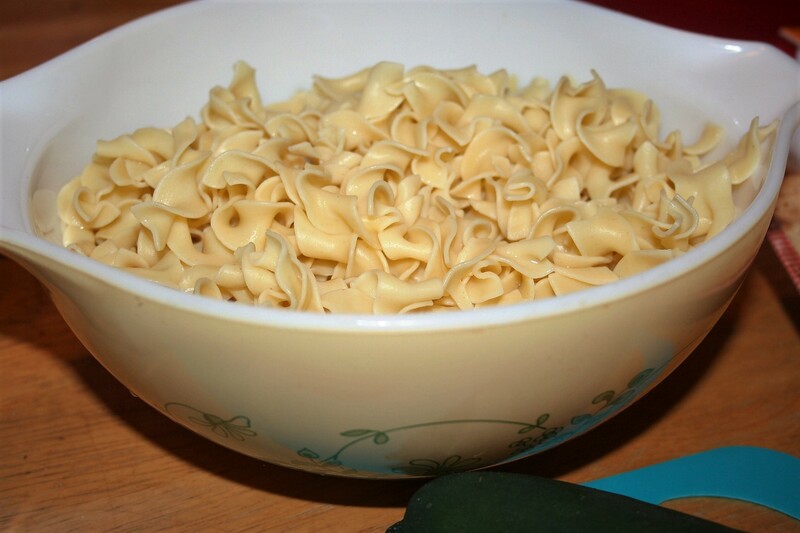 Low carb, low fat, low calorie homemade noodles. These are made from glucomannan, which is from the konjac root. There are noodles that you can buy that are good for a low carb lifestyle. Mind you, they smell very fishy but if you rinse them enough and cook them they aren’t bad. One brand is Miracle Noodles. They tend to be a bit rubbery tasting but when used with the right sauces, are wonderful on a low carb way of eating. Trim Healthy Mama has their version of these noodles but they are not always in stock. Plus they are not very much like homemade noodles. 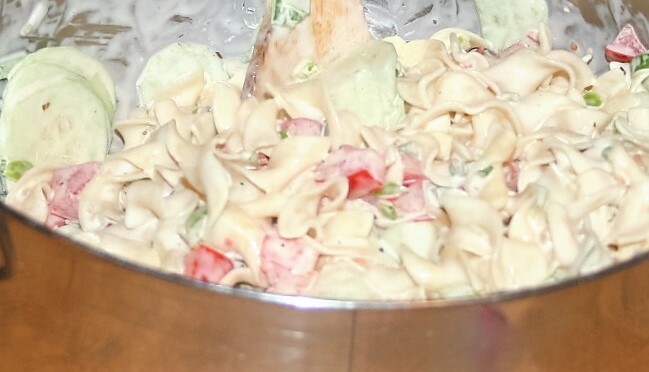 Enter Judy from Wonderfully Made and Dearly Loved who made a homemade noodle recipe using gluccie and oat fiber. Now, a word about oat fiber: not all are created equal. My first experience with oat fiber was with Anthony’s and the resulting product tasted like playdoh–yuck!!! Then I was told to try Lifesource and since it wasn’t very expensive, I gave it a try. Night and day difference! Recently I tried the THM version because we order from them monthly and I only bought the oat fiber from Netrition, so the the shipping costs are prohibitive but since we already place an order with THM monthly, it doesn’t really add much more. When I started making this recipe the other day, I didn’t realize that I was going to blog it, so I missed taking a picture of the first step. I’ll try to remember to take a picture next time I make these noodles and add it to this post then. The family loves these, so I’ll probably me making them again before long. I make a double batch every time I make them. I tried a triple batch but found out that my food processor cannot handle it. So you process the eggs in the food processor. 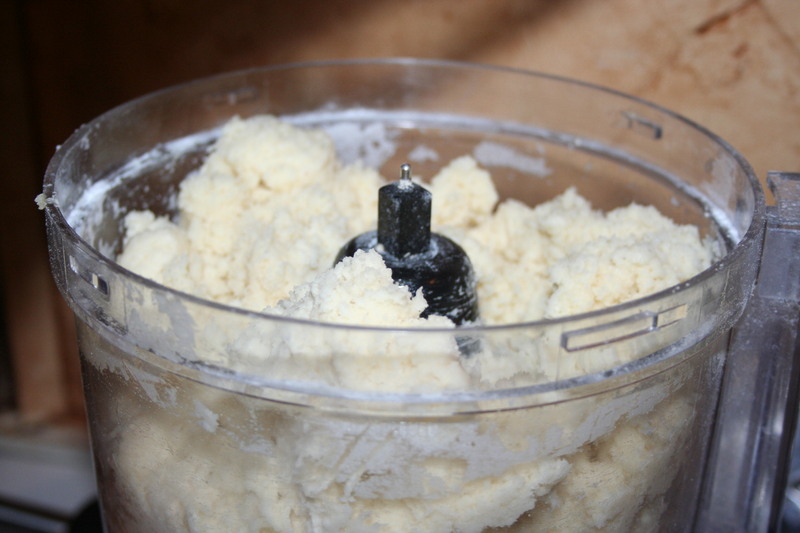 Then add the dry ingredients and whirl to combine. Then add the broth. Let it rest for a few minutes to allow those very thirsty ingredients absorb the liquid. 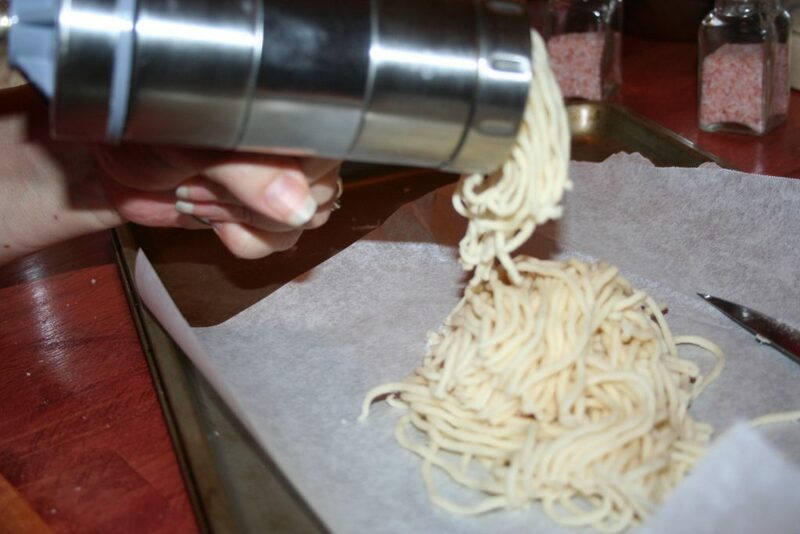 I bought the noodle press that Judy recommends so it makes quick work of making the noodles but the first time I made this recipe I rolled it out on parchment paper and used a pizza cutter to cut it into noodles. Put on the size noodle you want and twist and cut. Then let them sit in the refrigerator for a bit. Then add them to your recipe. This day I pan fried them in butter so they kind of reminded me of gnocci. I have also quickly boiled them in ham or chicken broth but must keep it short in the water. In just a few moments they are done. So, hop on over to Judy’s site and grab the recipe. It’s a keeper in my house. Literally noodles made from eggs, well, and a bit of cream cheese and oat fiber. Yep, don’t mock it until you’ve tried it. One thing I love during the holidays is noodles cooked in ham broth. 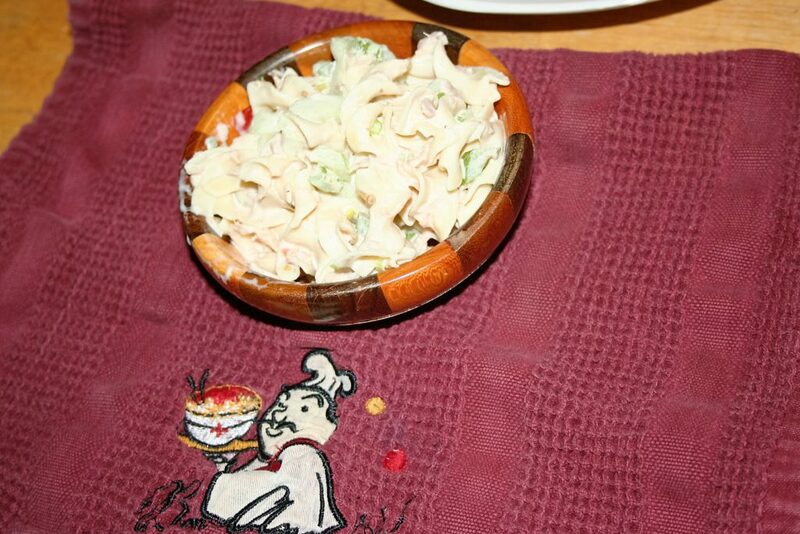 We simply call them ham noodles. Well, I’m preparing NOW for the holidays. Yes, I know I’m way early but I figure this is going to take some experimentation. However, I have made these noodles twice or thrice now and we are liking them. For a simple, quick noodle, these cannot be beat. All you do is take one ounce of cream cheese (which is 2 tablespoons), 2 room-temperature eggs, and 1/4 teaspoon oat fiber and put it in a blender. I know this doesn’t look like cream cheese and oat fiber in there with the eggs, but trust me it is. Blend on high for a minute or until completely smooth. Stop the blender and push down anything stuck on the sides with a rubber spatula and finish blending. 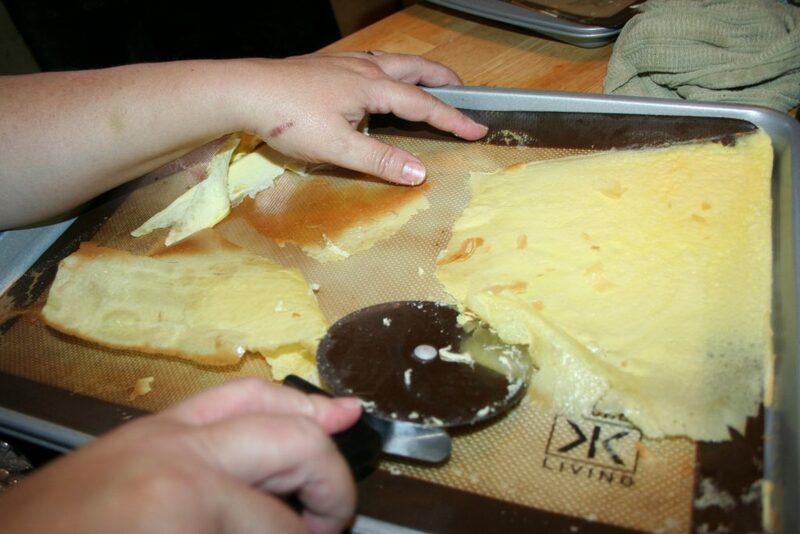 Now all you do is pour it onto a rimmed baking sheet covered with either a silpat or parchment paper. 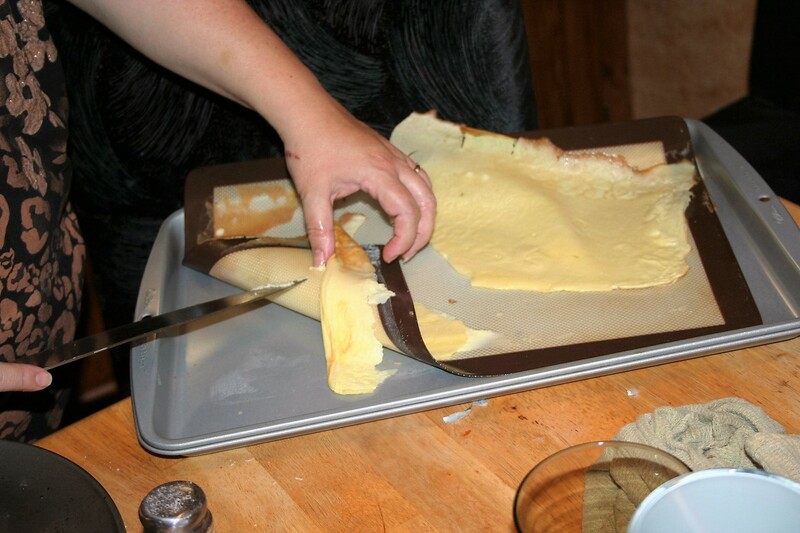 I was out of parchment paper and my silpat didn’t fit exactly. Then I will also note that my oven is not completely level. So, if I can make these noodles and they taste good, under these conditions, you can with whatever situations you have. It would be best for it to be an even layer and to be spread thinly over the entire pan. As you can see, I have struggles right from the start but I am baking it anyway. Just 5 minutes in the oven on 350º. As you can see, some my egg mixture went under my silpat. I was not going to be deterred. I used all but the thinnest bits of noodles. 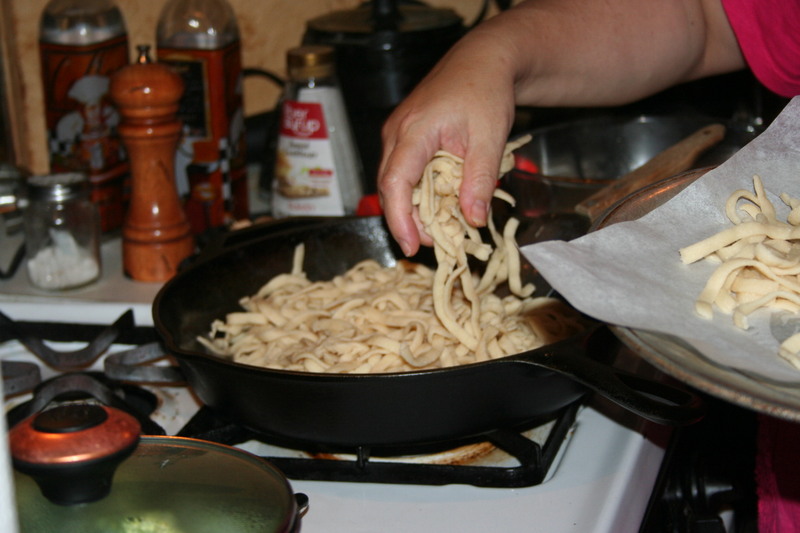 When it is cool enough to handle, release it from the silpat or parchment paper and cut into strips of whatever size you like your noodles, with a pizza cutter or knife. I even get the part that snuck under the silpat and cut it. 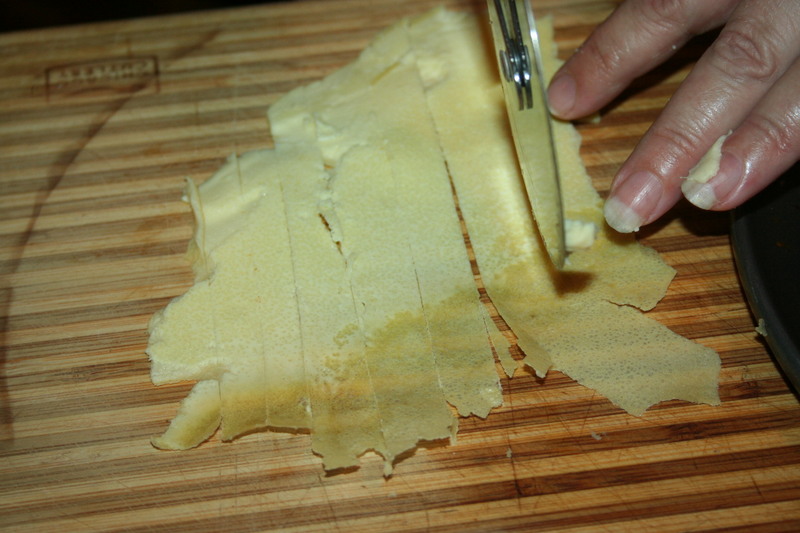 When the noodle is thicker, I cut the strips thinner and when it is thinnest, I cut them wider. Now you can use your noodles however you like. Once I used it in Tasty Tuna Toss-Up and Mike and I really enjoyed it. 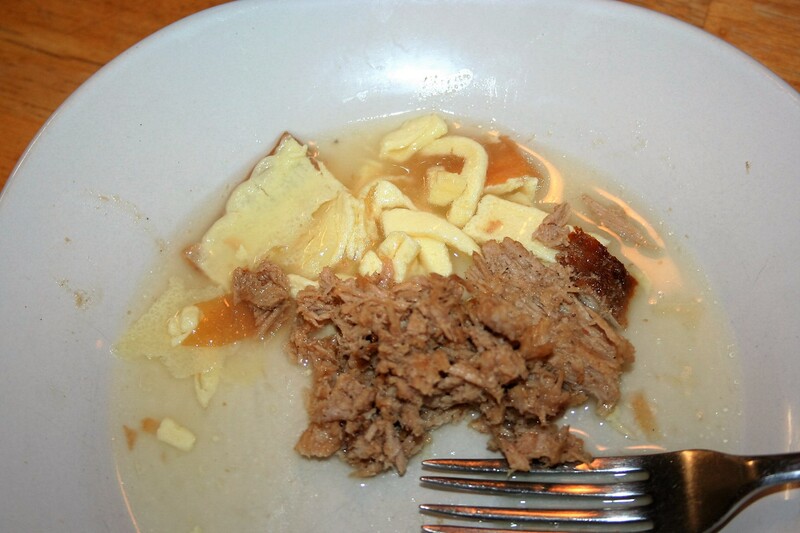 On this day though, I put them in some ham broth and thickened it a bit with a tiny bit of glucomannon (that has not yet been perfected). Everyone enjoyed the noodles and said it tasted like Thanksgiving. Next time I’ll try it with some parchment paper and see if I can’t get them a bit more uniform. I also want to work with it to see if I can make it a bit more like homemade noodles that my Aunt used to make with just egg, flour, and a bit of water. We shall see. But until then, this will do nicely. 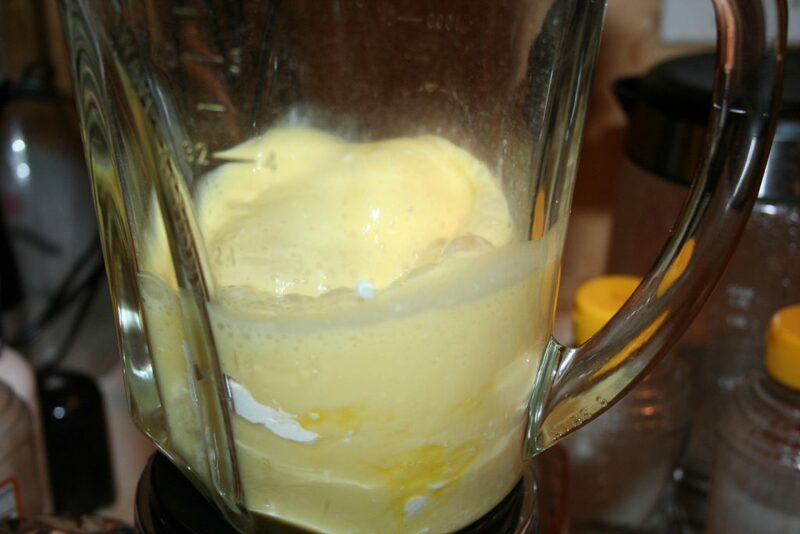 Combine all ingredients in a blender and blend until smooth, about one minute. 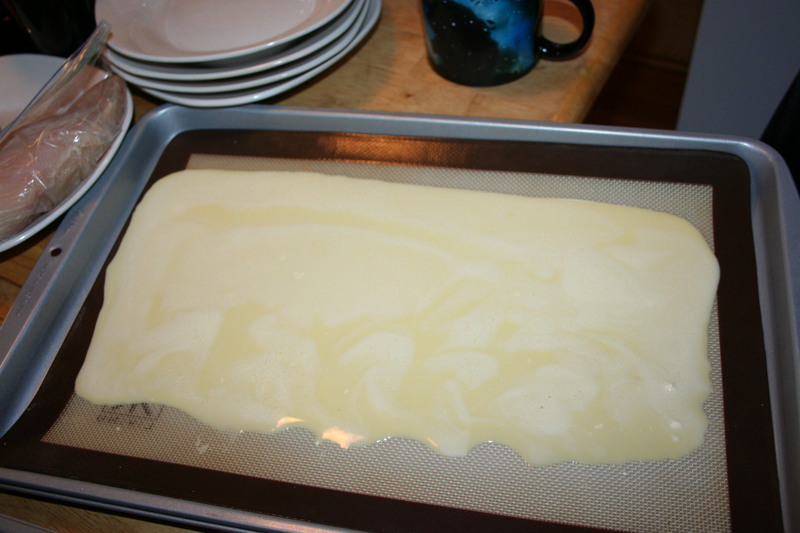 Pour onto a silpat or parchment paper covered rimmed baking sheet. 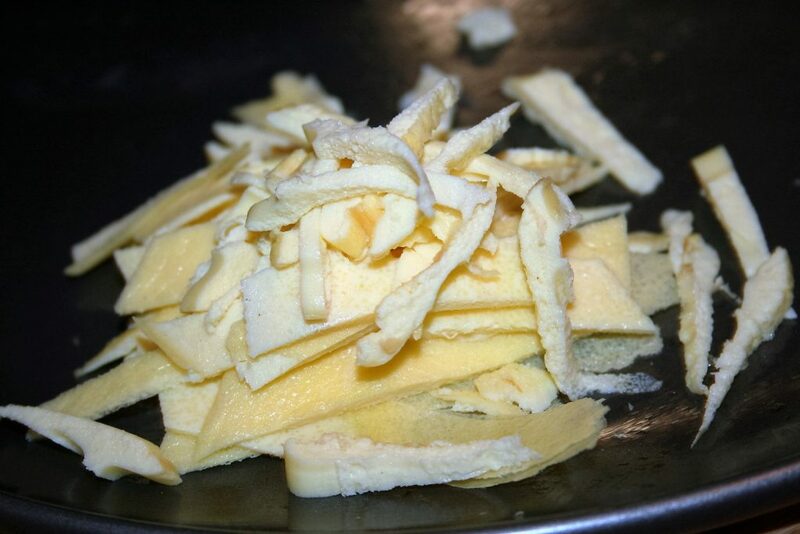 Bake on 350º for 5 minutes or until the thickest part of the noodle is firm. When cool enough to handle, cut into strips and use as desired. 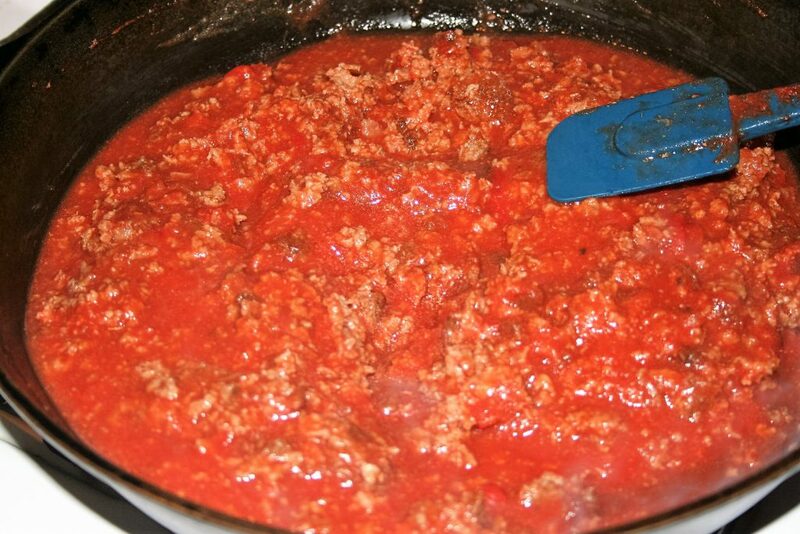 A tomato-based meat sauce with some of the acidity removed. 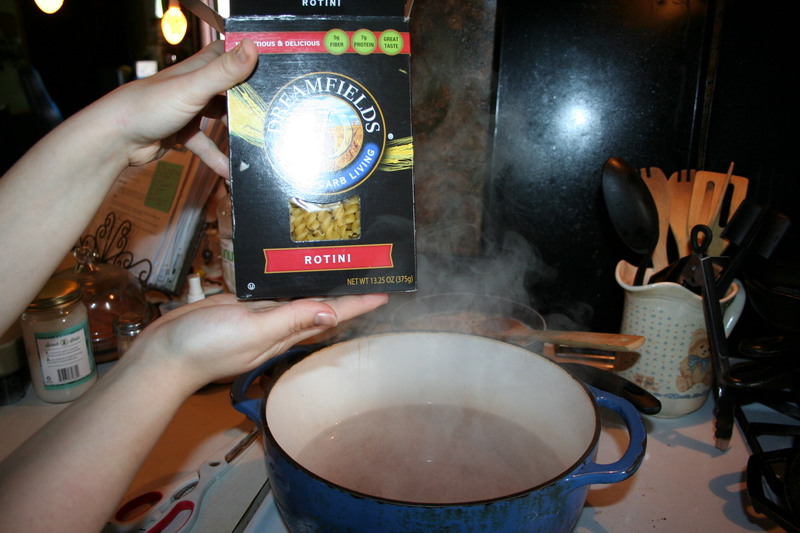 I’m going to share my “recipe” for spaghetti today. It’s one of those, not-really-a-recipe, kind of recipes though. My mom taught me to make this and she never used a recipe either. Actually, I use this same sauce, with only slight changes, for lasagna too. Don’t be scared off by the zoodles (the green strands). 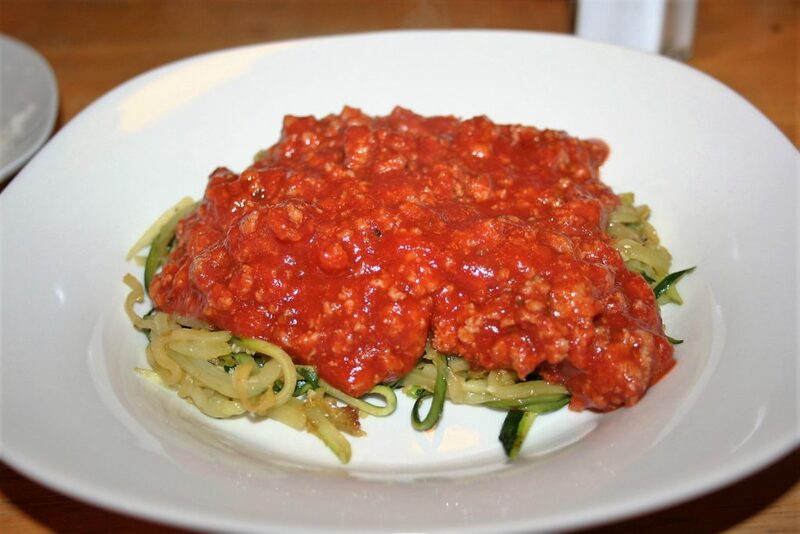 This is my normal spaghetti sauce that I serve over angel hair pasta but since I’m on keto right now, we are having it over the strips of sauteed zucchini. So this is super simple. 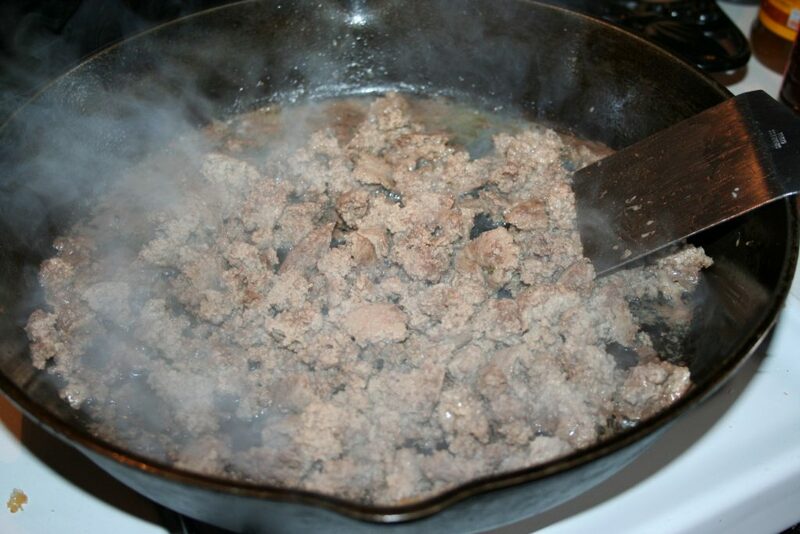 Start by browning one pound of ground meat. I use ground turkey right now. Season with some salt and pepper. Add one 6 ounce can of tomato paste. Then fill the empty can with water and add it as well; add one more can of water and combine. Mix it in well and add 16 ounces of plain tomato sauce. Add a sprinkling of onion powder and a dash of garlic powder. Simmer. 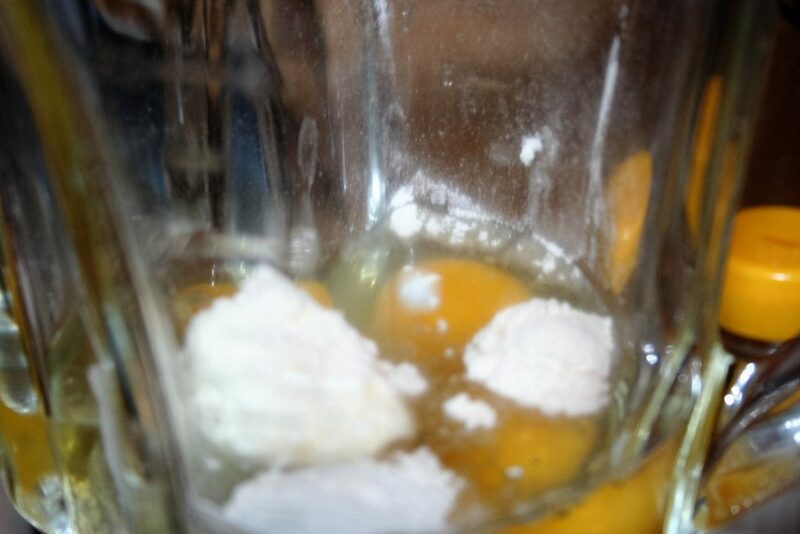 Now the important thing is to add about 1/8th of a teaspoon of baking soda. Stir it around. It will bubble up and remove some of the acidicness. (Yeah, that’s probably not even a word. ) If you cook this in a cast iron skillet like I did, don’t let it simmer very long with the baking soda in it or it will darken on top. It doesn’t do this in any other skillet or pan that I know of. 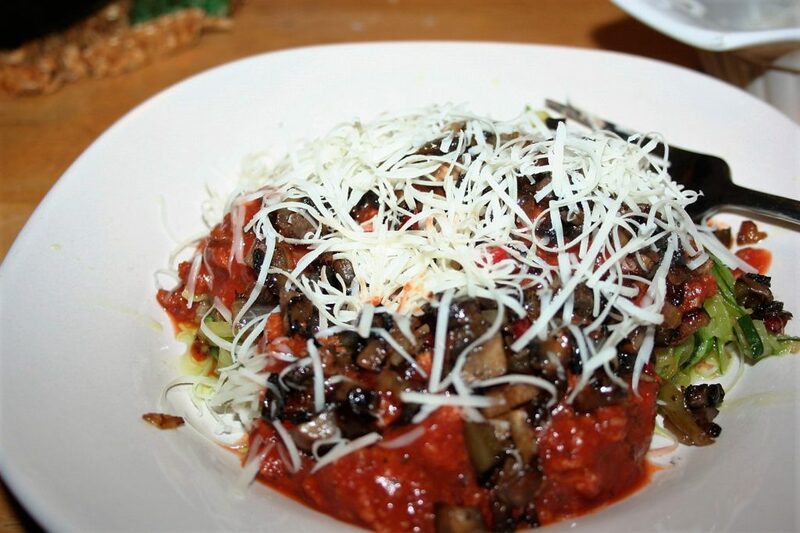 Serve over pasta or zoodles or whatever you choose. Here I added some sauted onions, peppers, and mushrooms on top, as well as shredded cheese. 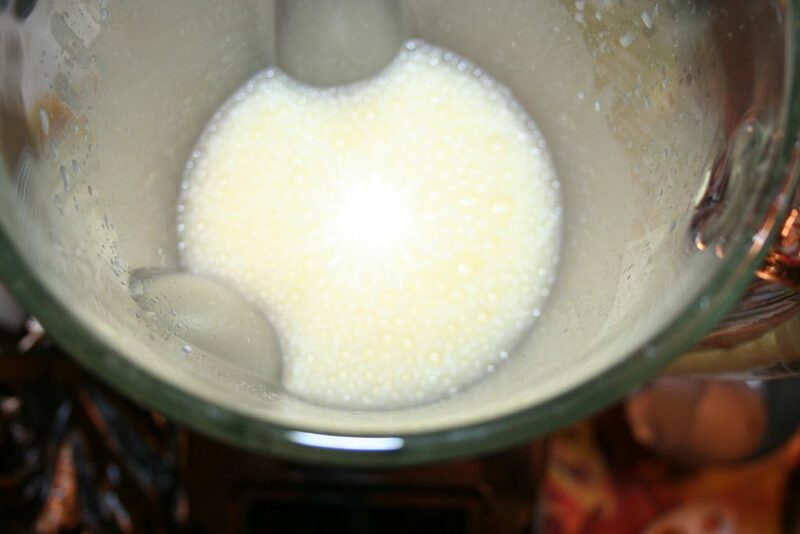 Once stirred altogether, it looks like this. Add tomato paste. 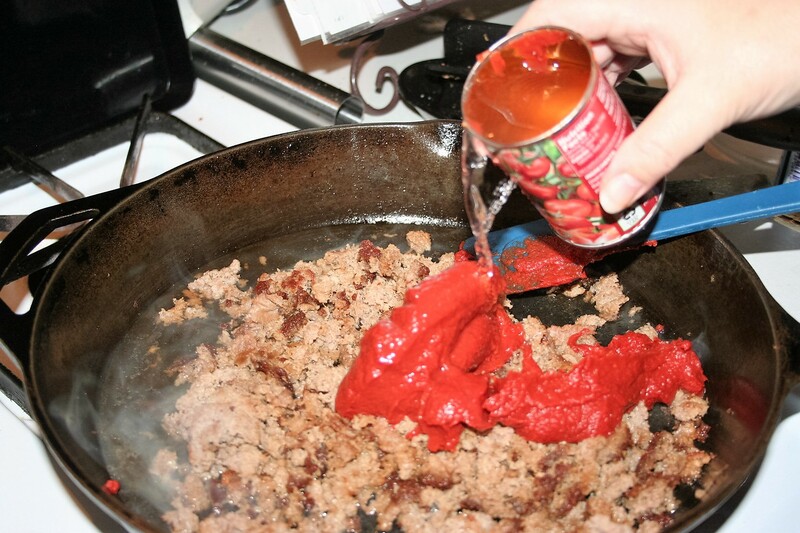 Fill empty can with water (two times) and add to meat and tomato paste. Sprinkle with onion powder and dash with garlic powder. Serve over zoodles or pasta. 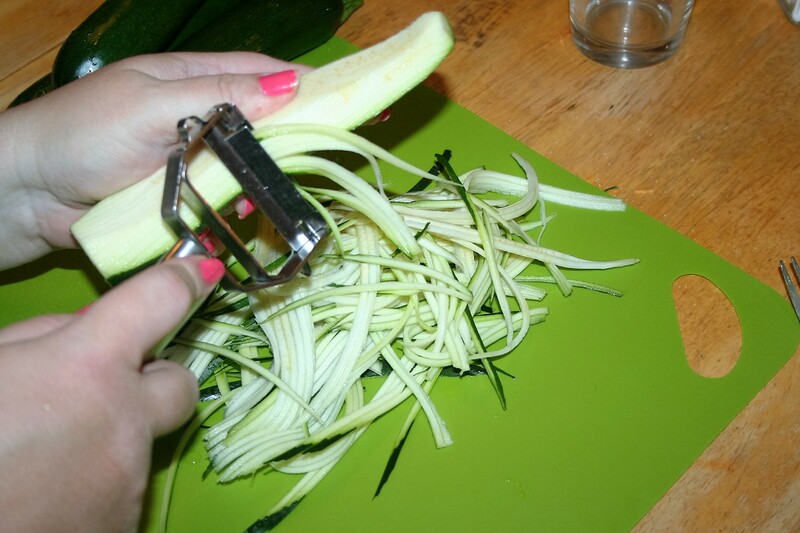 Julienned strips of small zucchini, sautéed in oil or butter. 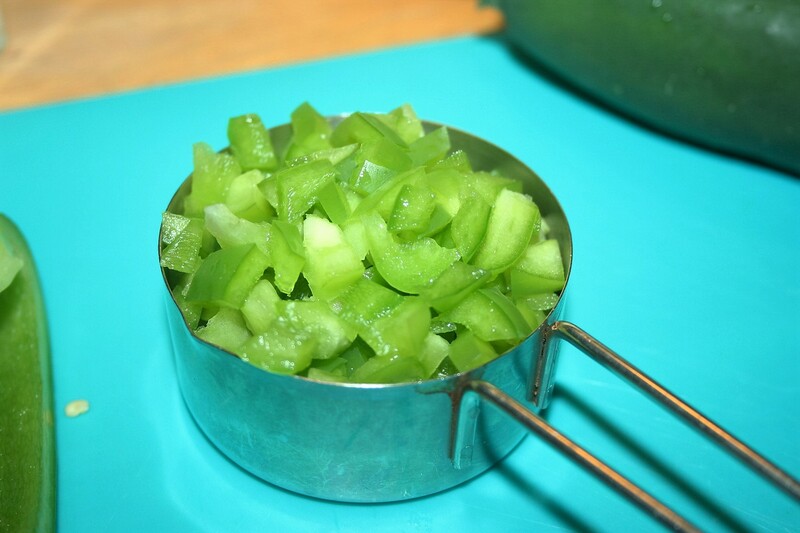 Today’s recipe is so simple that it isn’t really a recipe. This is made from zucchini but I think you could use yellow squash too. I wish I had one of those spiral veggie slicers because it seems like it would be a bit easier than the julienne peeler I have. Basically, all you need to do is wash the zucchini and then slice. Unfortunately, I don’t have any pictures of the next steps. You could steam it or boil it, which I have tried and did not like. What we have found we do like though is to season it with salt and cook it in a skillet with butter or coconut oil, until it is done to your liking. See? It’s that simple. 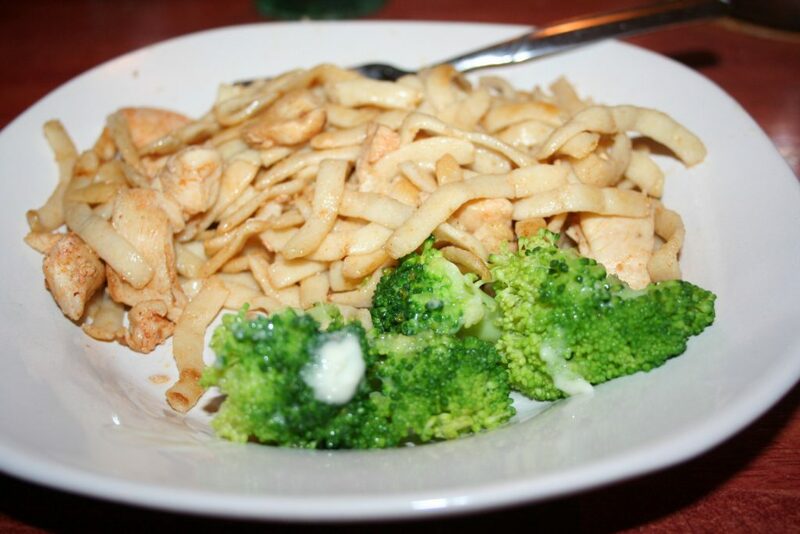 Serve with your choice of sauce. We’ve had this with Meatballs Parmesan, Pesto Meatballs, and pictured here with Spaghetti sauce. We have found that we prefer to use the smaller, thinner zucchini rather than the larger, fatter ones. Michael had liked these every time I made them except this last time when I used the larger zucchini; he said it had a stronger taste that he did not like. So be forewarned. Heat a drizzle of oil into a skillet. 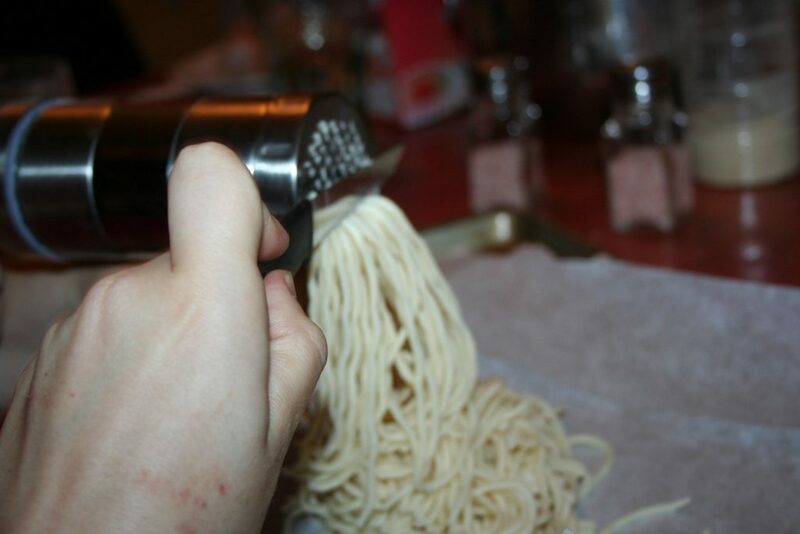 Serve in place of spaghetti. 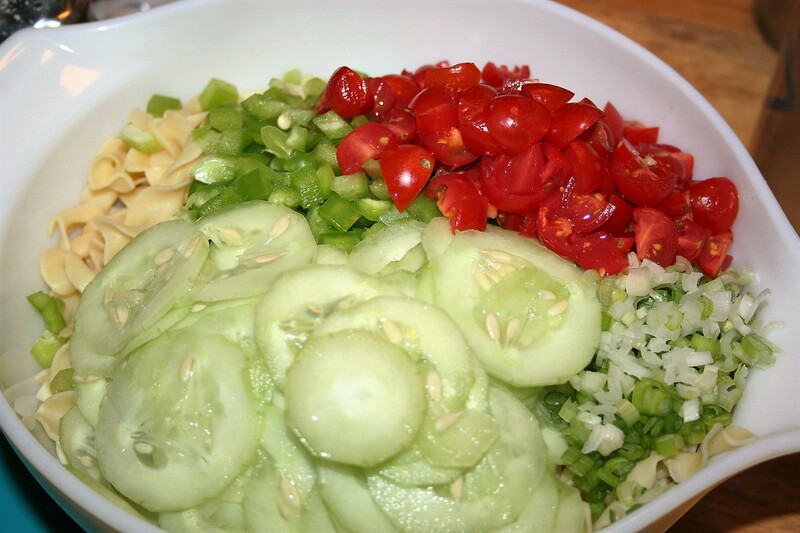 Cool pasta salad with a blend of cucumber, green pepper, tomato, and green onions that I enjoy every summer. 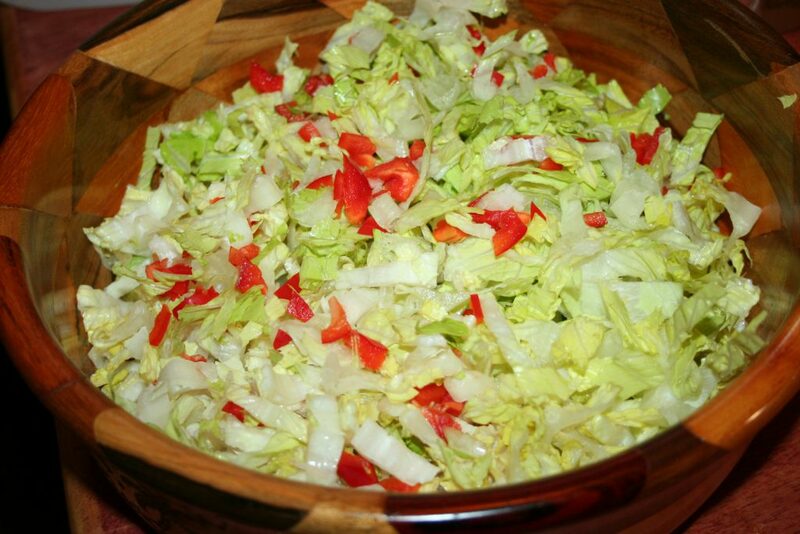 It could be eaten year round but, it’s really nice when it’s hot to have this chilled salad. Many, many, many years ago, I was invited to a ladies luncheon. 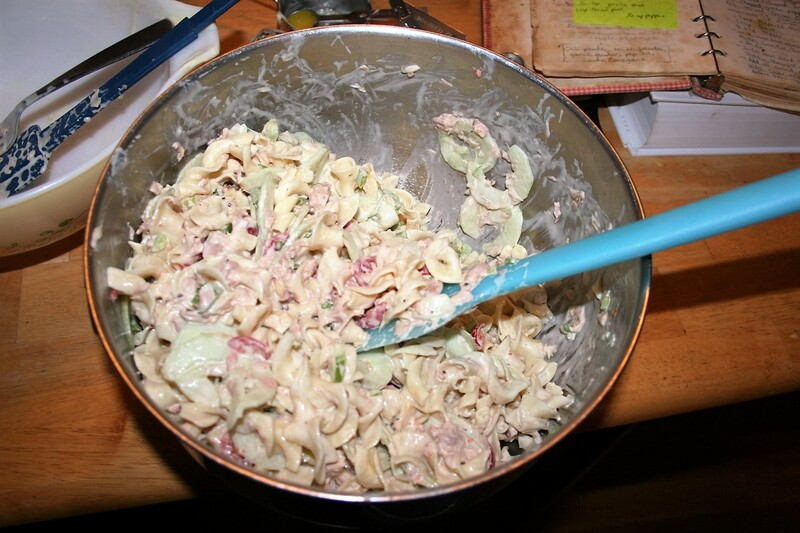 This is one of the items she served and was gracious enough to share the recipe with me. I loved her luncheons. She’d have about 30 ladies there with various tables set up for lunch, which was buffet style. I remember one year in particular, she had about 8 or so different kinds of salads. I’m not a very adventurous eater, so this particular lunch as a bit of a stretch for me. 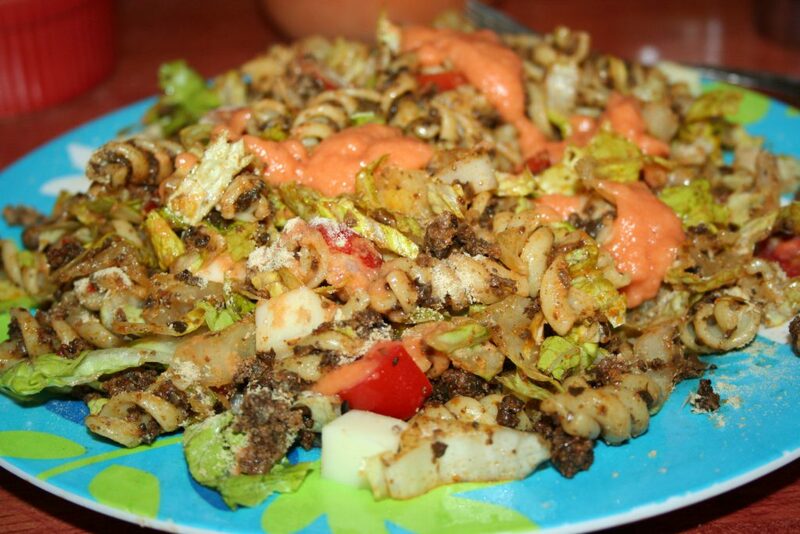 I was surprised to find that I liked several of the salads and most everything was good. I asked for two or three of her salad recipe that day and this is one of them. I don’t make it very often but when I do, I wonder why I didn’t make it sooner. 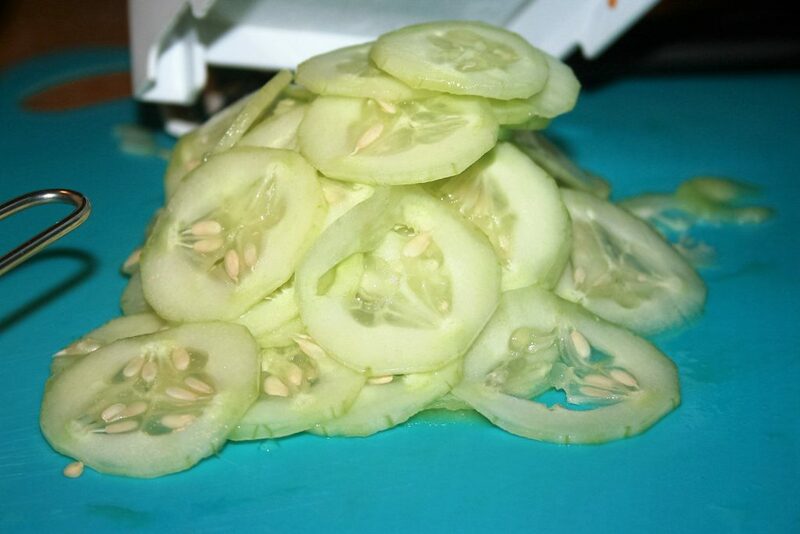 Next peel and slice cucumber. I use my mandolin with the #2 size slicer on it. 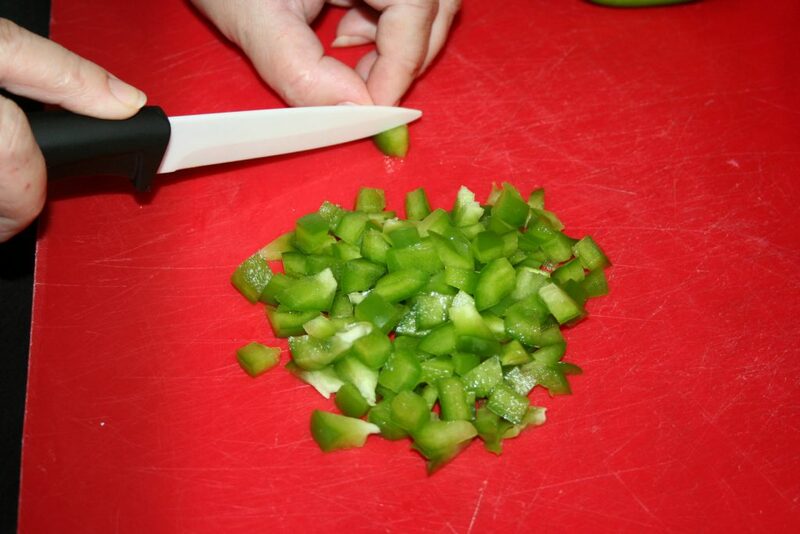 Dice some green pepper. Again, I like mine diced rather small. You’ll need a half cup. Next slice a green onion. And dice a large tomato. Add these all to the bowl. 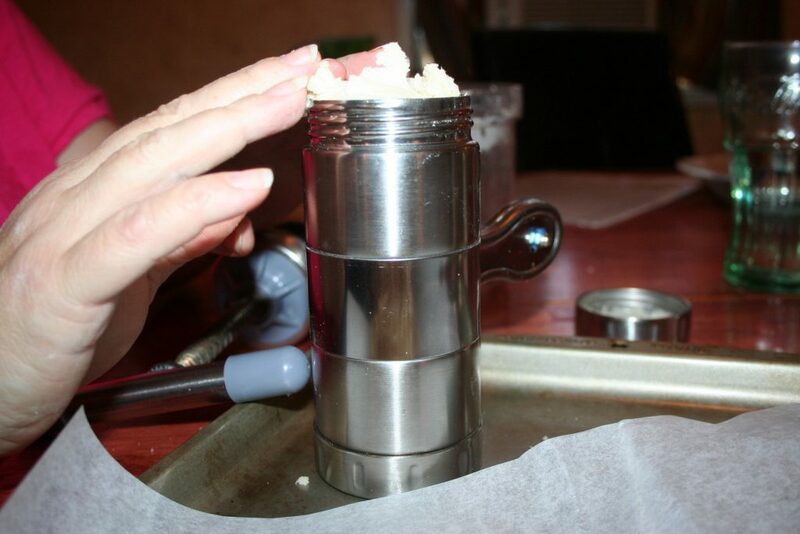 Drain and add 10-12 ounces of canned tuna. Now it’s time to mix up the dressing. The original recipe called for twice as much but it just seemed way too soupy for us. Also, I’ve mentioned before that I’m not a fan of vinegary or tart foods, so I tend to reduce the amounts of those items to make it more palatable for me. Combine 1/2 cup Italian dressing, (I like it best when I make the Italian from a packet because I can control the amount of vinegar) 1/2 cup mayo (I prefer Miracle Whip but Mike thinks he prefers mayo, so if you prefer MW, use it and you probably won’t need the added sugar) 1/2 teaspoon prepared mustard, 1/2-3/4 teaspoon sugar, 1/2 teaspoon salt and several shakes of pepper. Whisk it all together and pour over pasta and veggies. See . . . I couldn’t combine it all in that medium size pyrex bowl. The original directions said to cover and chill but we usually eat it right away. I like to make this because Sean and Tiffany are too picky and won’t even try it, so Mike and I have it for two or more meals. I have found that it is hard to take pictures of food that is in the white spectrum. The flash seems to wash it out but it looks dingy without it. I’m going to have to work on how to take the best pictures of white food soon. (I’m thinking I should use my telephoto lens, stand way off, and use the flash, that way I’m far enough away that it doesn’t wash out the food but still looks clear and bright. We’ll see.) 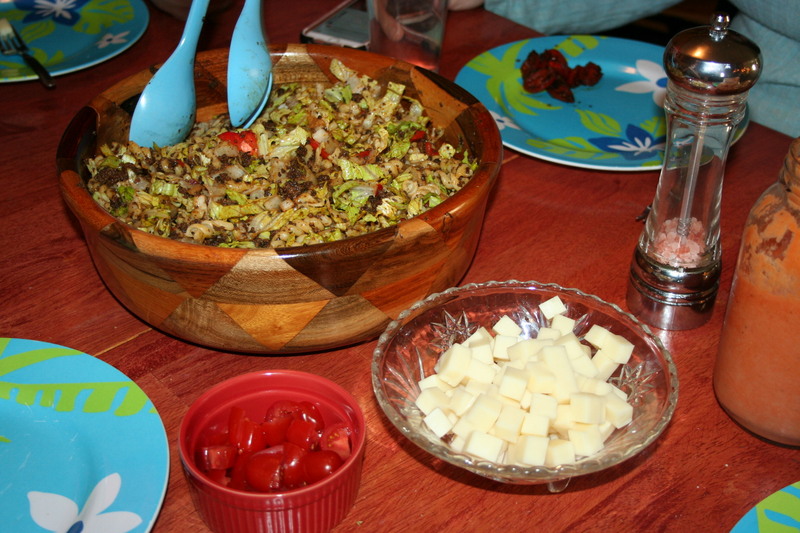 In the meantime, here are several pictures that do NOT do this yummy salad justice!!! Oh! I’ve also realized I need to get some colored plates again for photographing white spectrum food. That one just hurts my eyes. I should’ve pulled some of those tomatoes to the top. Cook noodles as directed on package. Drain and rinse in cold water. 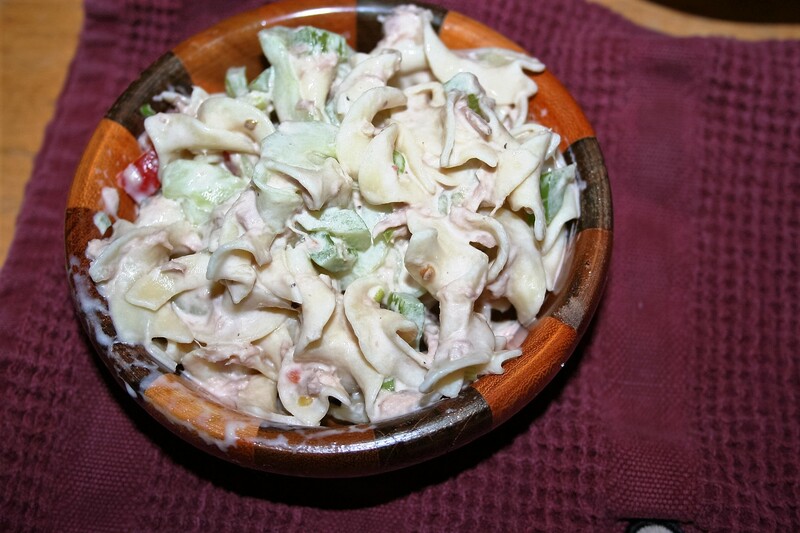 Combine noodles, tuna, and veggies in medium-large bowl. 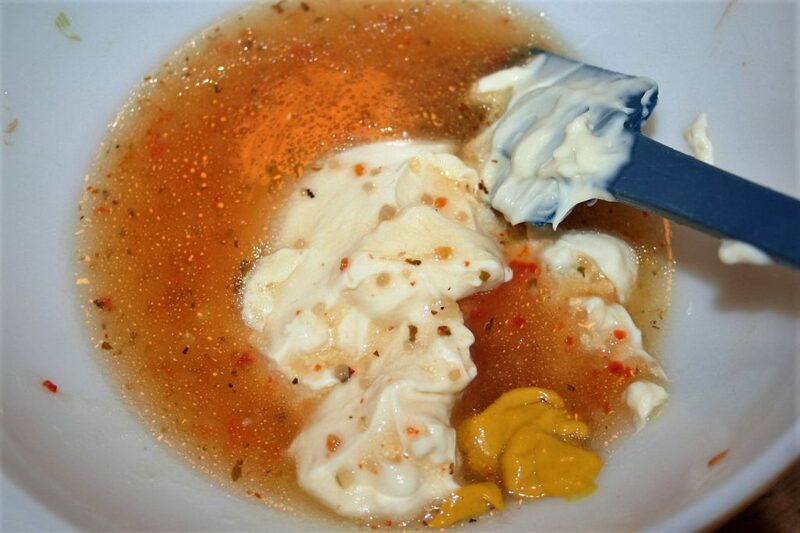 In a small bowl, combine dressing, mayo, mustard, sugar, salt, and pepper with whisk. Seriously though, my pictures do NOT do this salad justice. Make it and try it. You’ll like it. 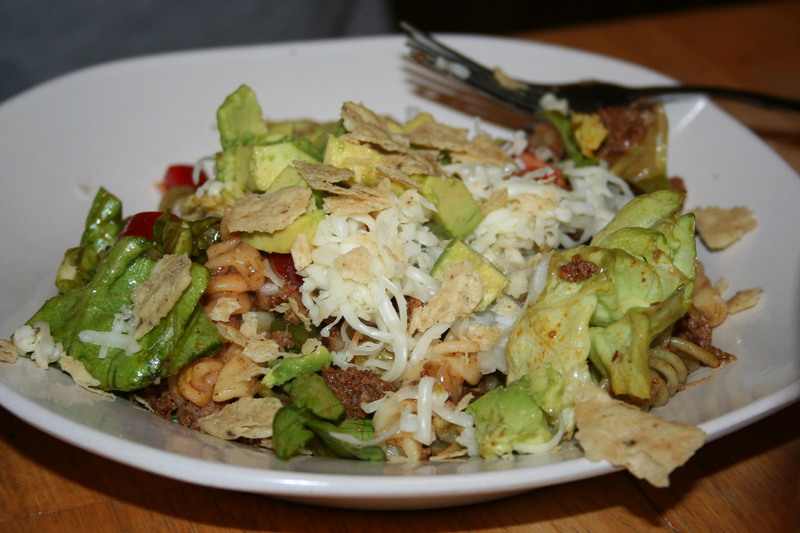 I don’t know why we call this Taco Mac Salad when there is no macaroni in the salad. 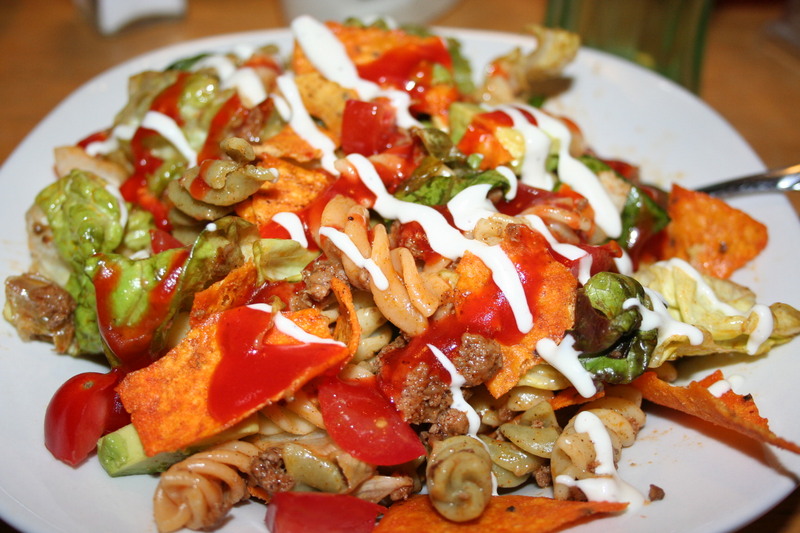 It should be called Taco Pasta Salad but then I’d mess myself up when I’m looking for the recipe. I think I got it from Menus4moms way back when it was free. 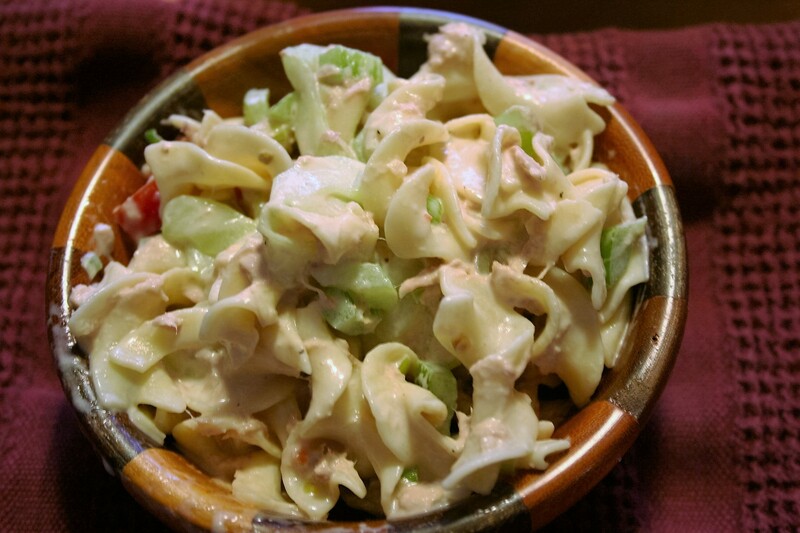 It is one salad recipe that my family really enjoys and I’m getting some veggies into them. 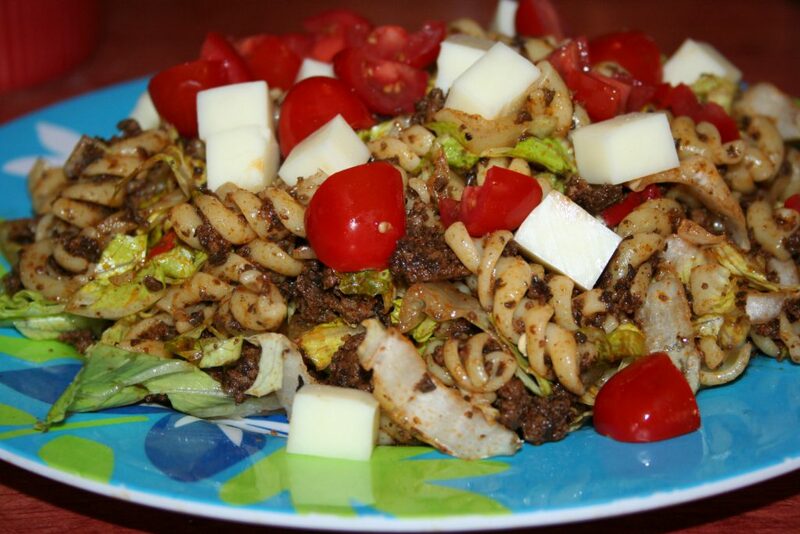 This recipe is easily adaptable to whatever you have, there are just some items that are musts: pasta, raw greens, meat, and cheese. Let’s get started. 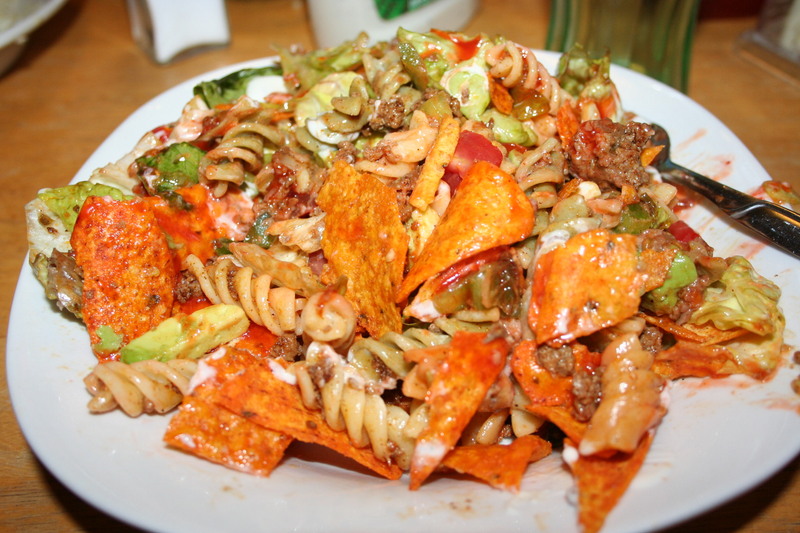 When we made this yesterday, I cheated and had purchased a bag salad. So we just emptied that into a bowl. I chopped up about a half cup of green pepper. Brown the ground meat and put a pot of water on to boil for the tri-color spiral pasta. 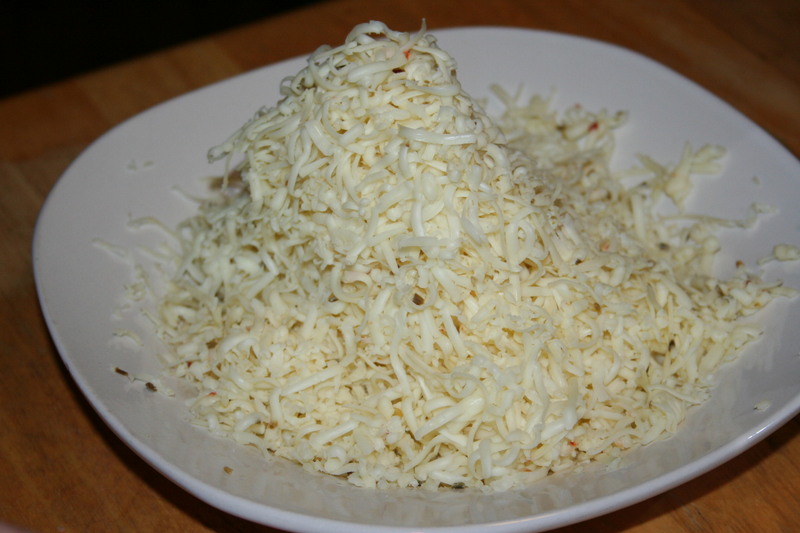 Shred the cheese. This night we used Pepper Jack Cheese. 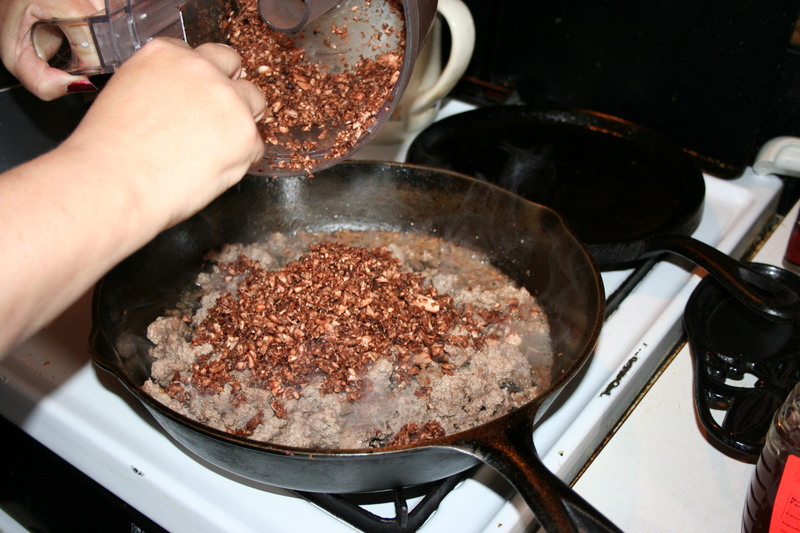 When the meat is browned and broken up into small bits, add the taco seasoning. 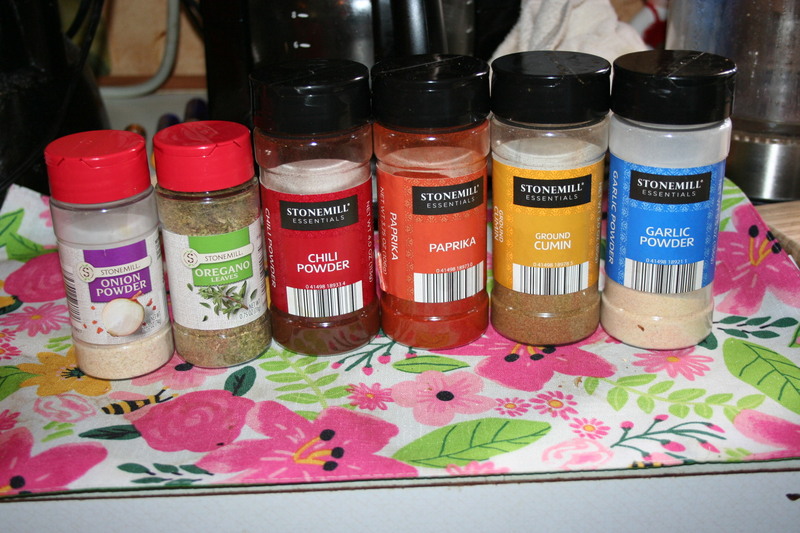 So far I’ve used pre-packaged seasoning because it is easiest but in the future we may use a mixture of onion powder, garlic powder, salt, freshly ground pepper, paprika, cumin, and chili powder OR we may just forego the taco seasoning altogether since it seems to bother some members of the family. Combine the lettuce, green pepper, cheese, meat, and drained pasta. 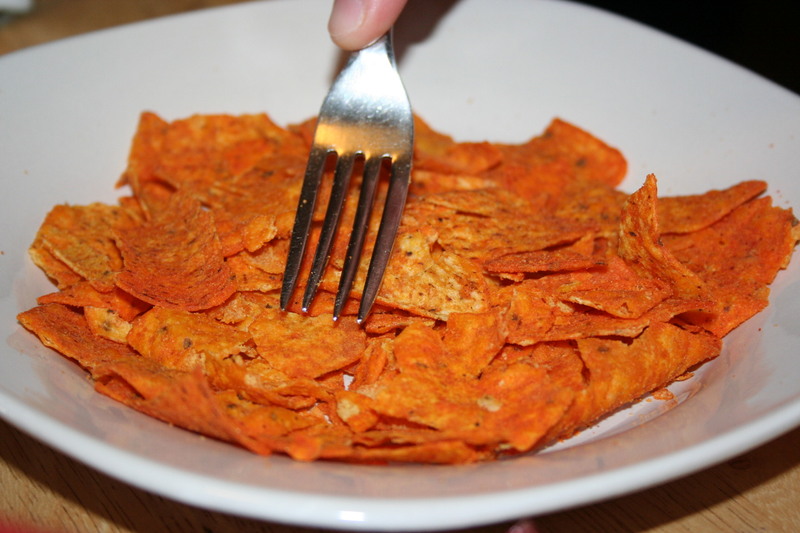 I let each person put the nacho chips on their plate rather than mixing it in the whole bowl; that way, if we don’t eat it all in one sitting, the chips don’t get all soggy and thus nasty. I also do not put dressing on this in the bowl, but let each person put on how much they want. Some of my kids don’t use any dressing at all. I also have diced tomato and either diced onion or green onion available for those that want them. As you may guess, some of my kids don’t like these items either. This night I had some avocado available as well. I like a little Catalina (as the recipe calls for) and a little Ranch on mine. 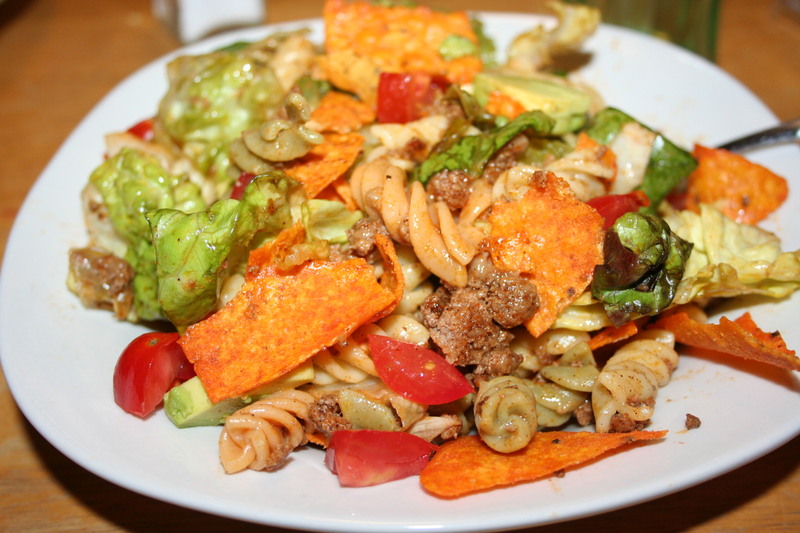 Mike chose to use plain tortilla chips in his because he said there was enough spiciness with the taco meat and pepper jack cheese. So you can see this is a very versatile recipe and lends itself to whatever you happen to have on hand. I hope you’ll give this a try. It really is quite good. 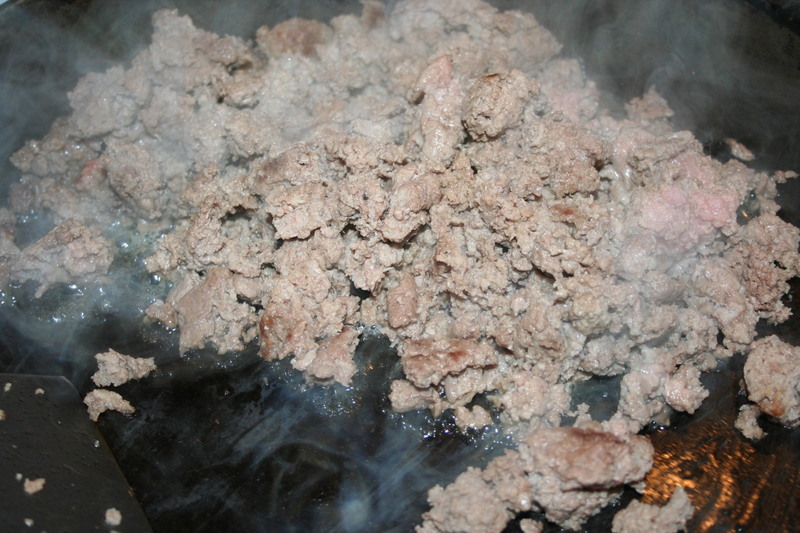 Brown the ground meat, drain if greasy, and add taco seasoning. Combine all ingredients except chips and taco seasoning. 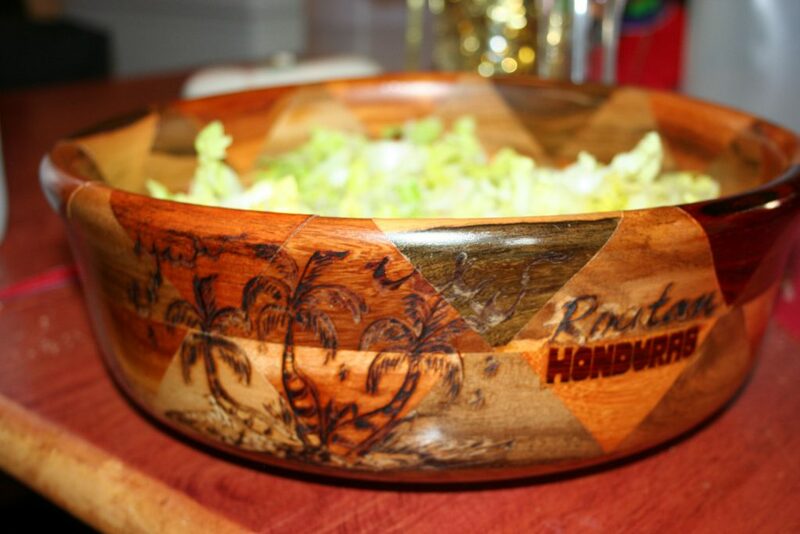 Serve with chips crushed in bowl with salad and add dressing as desired. PS. 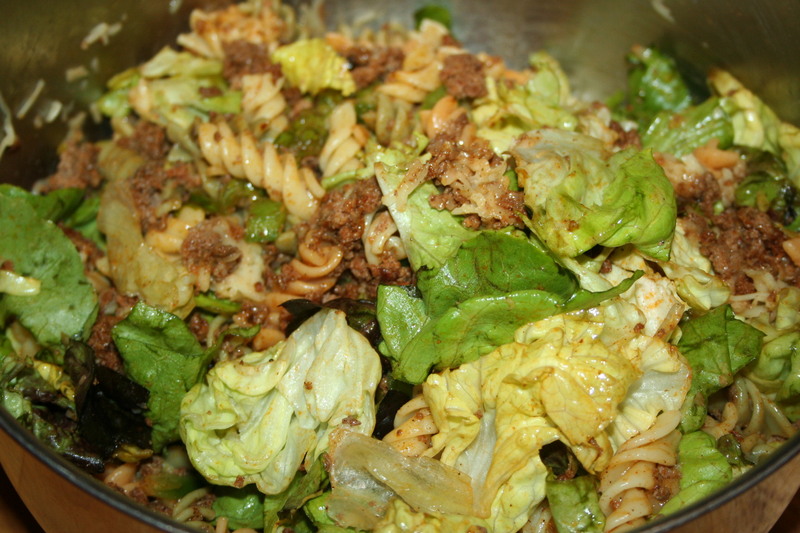 The original recipe said to combine the cooked pasta, lettuce, green pepper, and 1/2 cup diced onion with some salt and pepper and chill. Then when you are ready to serve it, add the warm meat, chips, and 1/2 cup French dressing; toss gently and sprinkle with the cheese just before serving.